This week’s images come from a visit to New York that I made in October 2011, when I was moderating a panel at the Audio Engineering Society convention. And since it wouldn’t be a New York City trip without at least one skyscraper transmitter site, it was time to head over to the Empire State Building and get caught up on some of the construction and renovation that’s been a constant feature of life here since 9/11 turned everything upside down. 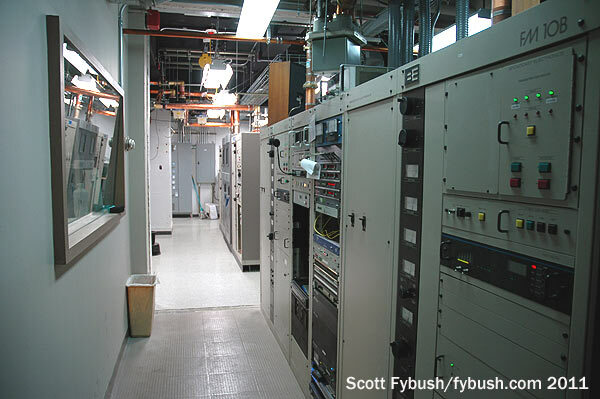 Our visit began on the 79th floor, which housed offices for many decades before being repurposed as a transmitter floor when the building needed more broadcast space after 9/11. The 79th floor is where that B-25 slammed into the side of Empire during World War II (and where the scorch marks from the ensuing fire have been preserved over the elevator bank), and it’s where WPIX (Channel 11) and WABC-TV (Channel 7) have their transmitter rooms. It’s also where several of the FMs that moved here from the World Trade Center ended up, including public station WNYC-FM (93.9). 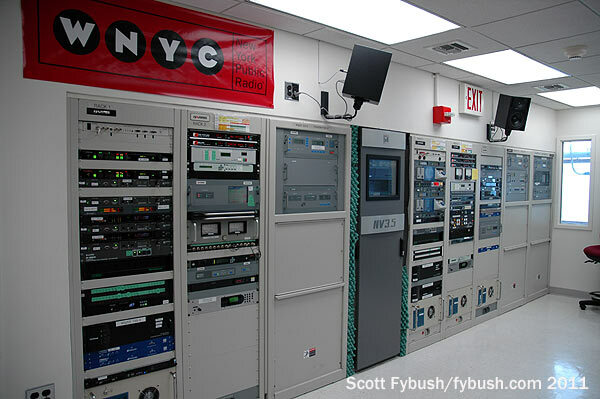 WNYC added a sister station in its 79th-floor space in 2009, when it acquired the intellectual property of WQXR (96.3) and the broadcast facility that had been WCAA (105.9). 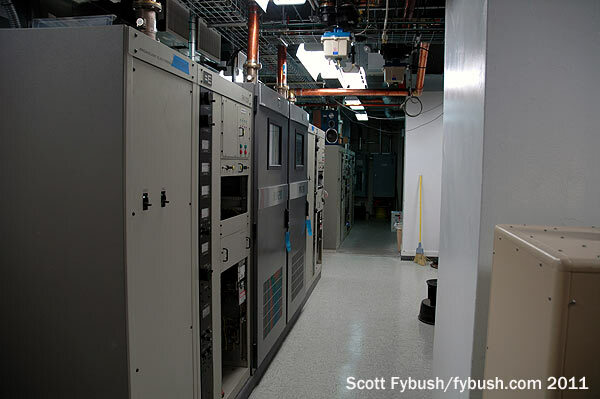 Univision Radio, which ended up with the 96.3 facility as WXNY, kept the former WQXR 96.3 transmitter room upstairs, and WNYC moved the 105.9 transmitter from Univision’s WXTV (Channel 41) room over here to the WNYC-FM room on 79. 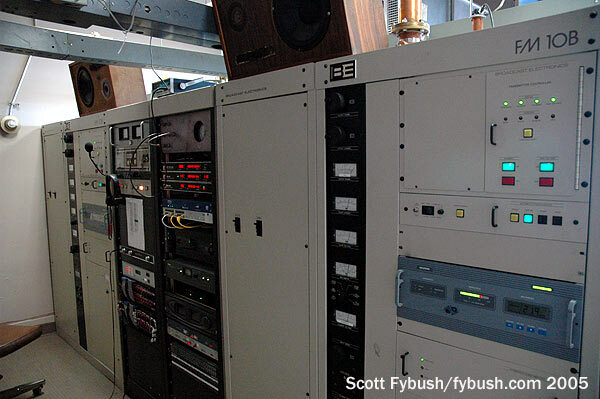 That’s the new WQXR 105.9 on the left, above – the Harris Z had been WCAA’s main transmitter, and WNYC added the new Nautel NV3.5. 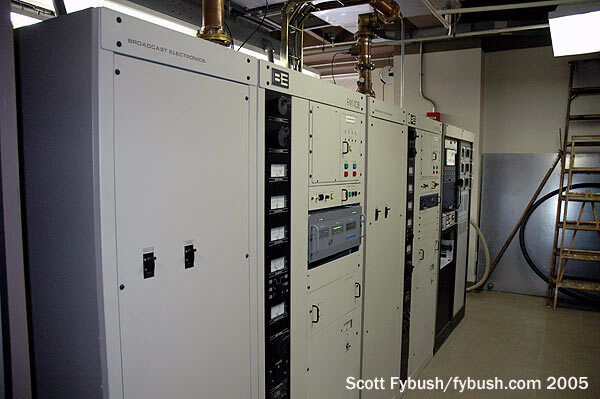 WNYC-FM’s own Harris transmitters are on the right, and just out of frame to the right of those is a little office area that can also serve as an emergency studio should the need arise.And the studio-transmitter link? 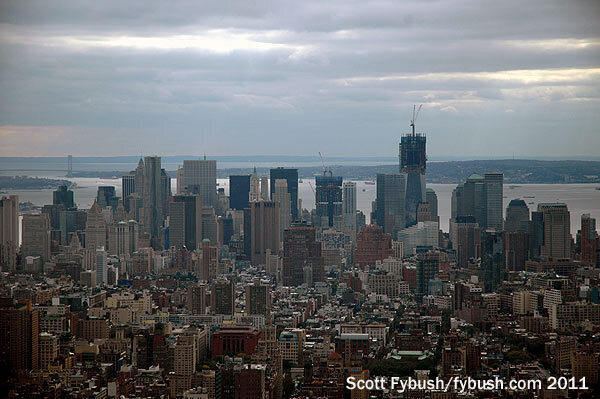 That’s easy: it’s line of sight right from the south side of the 79th floor downtown to WNYC’s Varick Street rooftop! 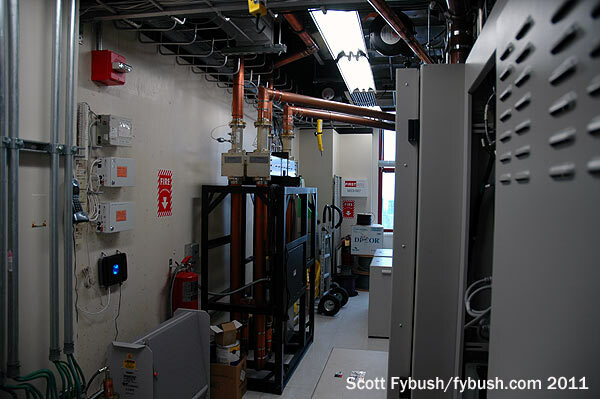 Our Empire visit also gave us an opportunity to update the transmitter side of Clear Channel’s ongoing rebuild of its New York facilities. 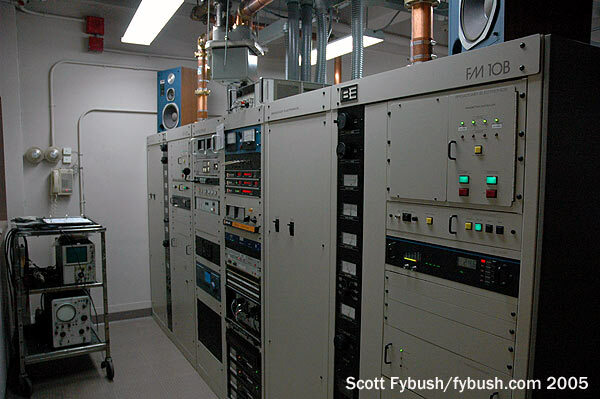 Back in 2010, we showed you the new Clear Channel studios on Sixth Avenue just south of Canal Street – but there was consolidation going on at the transmitter end, too. 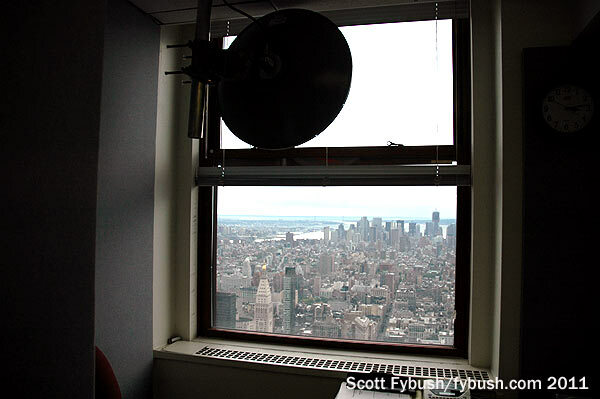 On the 81st floor, WKTU (103.5 Lake Success) had moved in to WHTZ (100.3 Newark)’s space in 2002 after the old WKTU side at 1 World Trade Center was destroyed. Upstairs, the remaining three Clear Channel stations had each been in a separate room, a legacy of the days when each was owned separately. 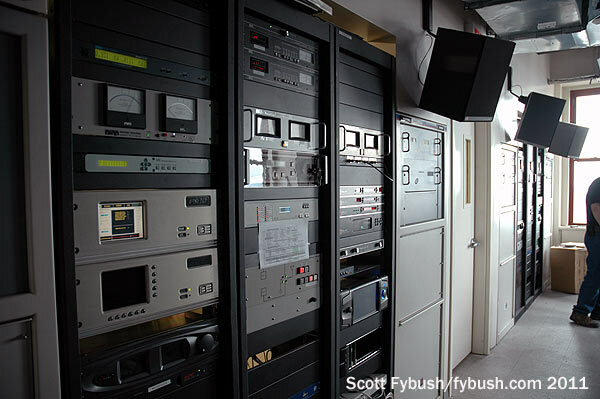 WWPR (105.1) was in the same 82nd-floor room where it had been for decades as WRFM, WNSR, WMXV, WTJM and so on. One floor up on 83, WAXQ (104.3) and WLTW (106.7) were neighbors in separate rooms, all chugging away with a lineup of BE transmitters. When we stopped by in late 2011, Clear Channel’s engineers were just wrapping up a big project that kept WAXQ in its space (complete with that window into what had once been a makeshift emergency studio), but blew out the wall between WAXQ and an adjacent space that now houses the relocated transmitters for WWPR and WLTW. In addition to moving one of each station’s BE transmitters into the new room, both stations also got new Nautel NV20s as part of the move. Thanks to Jim Stagnitto, then of WNYC, and to Clear Channel’s Doug Irwin for the tours! 2013 is drawing to a close…but we’re all set to make sure your wall is full of lovely radio images for the start of 2014! 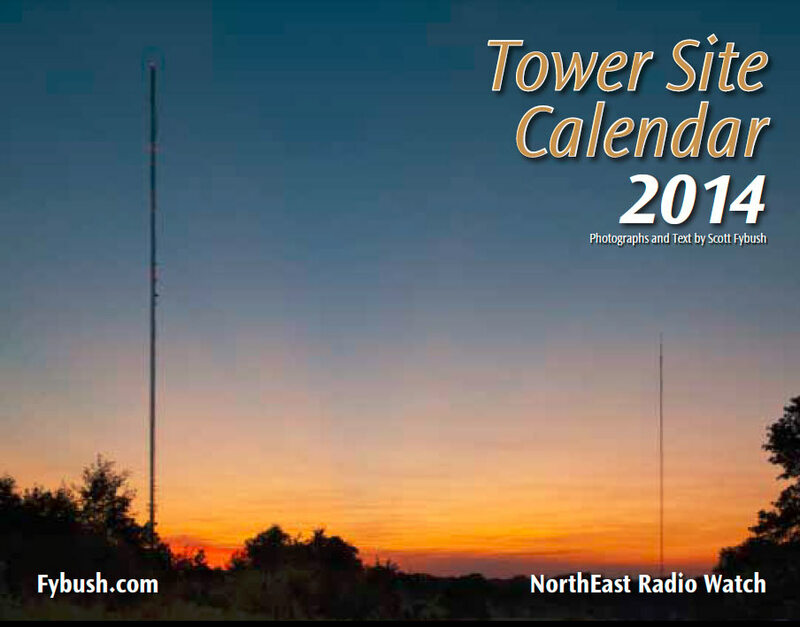 The Tower Site Calendar, 2014 edition, is shipping daily, spiral bound, shrink wrapped and best of all, with a convenient hole for hanging!